Performance KitsThere are 10 products. ECUmaster EMU Black ECU for all Toyota-engined Lotus models. High specification, feature rich, fully programmable and mappable by us on our in-house rolling road dyno. The 280S upgrade kit delivers over 60bhp power increase versus the standard Exige S / 2-11. Installation at Hangar 111 workshop. Direct replacement uprated intercooler for all supercharged Exige S and 2-Eleven models. Cost-effective alternative to chargecooling on track-oriented and race cars. ECU Reflash for 220bhp Exige S. Gives appx +35bhp gain over standard 220bhp. Price includes injectors. Top-mounted chargecooler system with front-mounted pre-cooler. 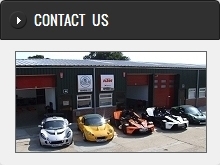 Specially developed for all Exige S variants and vehicles fitted with our aftermarket supercharger packages. Automatically manages oil pressure to reduce risk of oil starvation. Fitment: All Toyota engined cars. 5700 Cam-switch reflash map for cars up 2004 onwards with cable or electronic throttle type. Fitment: Elise 111R - Exige S2 and 2-Eleven (NA cars).